DINOSAUR | Last week the Bedrock Depot, a sandwich and ice cream shop in Dinosaur, was burglarized, prompting many Dinosaur residents to ask questions about the availability and capabilities of local law enforcement services. Sometime late Wednesday night or early Thursday morning the Bedrock Depot had a window smashed out and money stolen. According to Depot owner Leona Hemmerich, the culprit took cash from the employee’s tip jars, cash drawer, some merchandise and made a general mess. She estimates the total loss at just over $2,000. “This has been very bizarre in that they didn’t take a lot of high dollar items, nor did they take all the cash,” she said. The burglar left behind a blood trail, likely cutting themselves on the glass while breaking in. Upon entering the Depot Thursday, a startled Hemmerich immediately called the local dispatch. Off-duty Town Marshal Taffine Patterson responded within 30 minutes of the call. Patterson was hired last fall when the Town of Dinosaur decided to internalize local law enforcement services. According to Hemmerich, since then the town has failed to provide Patterson with the needed tools to conduct an investigation into the break in. “Our frustration in this whole situation is that the Dinosaur Town Council has once again run off their town Marshal (Patterson has resigned her position effective this week), so while she did the initial report, she informed us she wouldn’t be here to follow through with it. She called the Moffat County Sheriff’s Office to conduct the investigation since she couldn’t even do fingerprints, thanks again to the Dinosaur Town Council that refuses to provide the necessary tools for her to do that. Unfortunately, the Town of Dinosaur has alienated the Moffat County Sheriff’s office so they wouldn’t come out to conduct an investigation,” said Hemmerich. Dinosaur Mayor L.D. Smith says the town will be able to quickly replace Marshal Patterson and has received a number of credible applicants. He also said he is prepared to “properly outfit the marshal.” Smith, who took office in April, said that Dinosaur is making drastic changes and needed upgrades to equipment all over town including the Marshal’s Office. Moffat County Sheriff KC Hume said that their office did not respond to the break-in because they don’t have jurisdiction in Dinosaur. According to Hume, because Dinosaur is an incorporated town, they have the legal responsibility of providing law enforcement services. 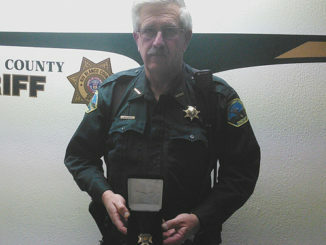 In years past the town had contracted with the Moffat County Sheriff’s Office for those services, and there were deputies living in the community. However, according to Hume, last fall Dinosaur leadership decided to end that agreement and hire their own Town Marshal. Hume stated that had there been a crime in progress or a life-threatening situation they would have responded as quickly as possible, but with their office located 90 miles away it would still take time. The Town of Dinosaur has a history of challenges with law enforcement. In 2007, then Town Marshal Russel “Wayne” Eller made state news when he was arrested on charges of falsifying his resume and work hours. Eller had been fired by the town one year prior to his arrest for failing a background check. Judith D. Coates Beard, 68, of Dinosaur passed away July 27, 2009, at Pioneers Medical Center in Meeker. Judith was born July 5, 1941, in Scottsville, N.Y., to James M. and Lois Elizabeth (Ely) Coates. MEEKER I A search warrant served on a residence in Meeker resulted in the arrest of a 35-year-old local man on two drug charges.